Thank you for your offering last weekend which totalled £628.70. Attendance was 252. Faith on Tap - this week! Come along! This Thursday 7th May we begin a series of monthly evenings at 7.30 pm in the Parish Centre. The aim of the evenings is to enable exploration of the Catholic Faith - there will a talk for enquiring minds from gifted speakers! Sr. Roseann Reddy of Glasgow’s Sisters of the Gospel of Life will be with us for a talk followed by opportunities for questions. Future speakers include Bishop John Keenan, Fr. Lawrence Lew OP, Dr. Caroline Hull, Canon Luiz Ruscillo, Rev. Dr. Andrew Pinsent and Sr Julian Ekman RSM. A wonderful opportunity to come along in a relaxed setting and explore our wonderful Faith! Monday to Wednesday 10.00 am - 2.00 pm and Sunday 12.00 - 3.00 pm. For more information contact the centre manager, Trevor Tiffin, on 524295. Meet this Tuesday at St. Margaret Mary’s - all are welcome to come along. The group meets at 7.30 pm. There will be a Novena for Vocations in the deanery commencing Friday 15th May - we will host on Tuesday 19th May at Christ the King with a Holy Hour between 6.00 and 7.00 pm. The Novena will culminate at Our Lady and St. Joseph with a Holy Hour and Benediction beginning at 3.15 pm. More details to follow shortly. Many thanks to all who helped to make the celebration of the Sacrament of Confirmation on Tuesday evening such a success. Singers, musicians, readers, servers, sacristans and welcomers. The Bishop has written to thank the parish saying “The church looked absolutely stunning and the Confirmation was splendid – please do pass on my sincere thanks to all who were involved in this wonderful celebration”. Thanks especially to Ann Pinguey who has accompanied the candidates on their journey to the sacrament. Thanks also to Harraby Catholic Club for hosting the celebration afterwards and to the team at St. Margaret Mary Parish Community Centre for the wonderful spread - it was great to see the two social institutions of the parish working together. Alison Hather at St. Margaret Mary. A pilgrimage to Rome is being planned for May 2016. There will be a planning meeting for those interested in joining the pilgrimage this Tuesday at 6.00 pm - where we’ll discuss the length of the pilgrimage and the price range. Have you ever wondered what God’s plan is for you? Have you ever thought that God may be calling you to serve his people as a priest? If your answer is yes to one or both of these questions, then why not contact the Vocations Team and begin to discover what God’s plan is for you. Contact Fr. Darren Carden – priest@lancastervocations.org /Tel: 01772 719604 / Mobile 07552795060 or Fr. John Millar – jwmillar1@gmail.com / Tel: 01228 521509. There will be a retiring collection next weekend in support of CAFOD’s appeal. You may want to give via the Disaster Emergency Committee - http://www.dec.org.uk | 0370 60 60 900 | or at your own bank. Thank you for your offering last weekend which totalled £658.61 Attendance was 227. What would happen if we really gave ourselves to God's presence with deep expectation? How often do we make the space to ENCOUNTER God? You are invited to a weekend with the Cor et Lumen Christi community, St Cuthbert’s The Old Convent, Wigton, CA7 9HU, on 8-10 May. This weekend will include input to help us grow in expectation and hunger for the living God, and opportunities to really soak in the divine presence by giving our time to God in a variety of ways. Donation only event after £10 registration fee, includes meals! To register, phone 016973-45623, or visit www.coretlumenchristi.org. Our diocesan residential youth centre, Castlerigg Manor, Keswick, welcomes families to join in their Family Weekend: 22-24 May. Cost: £75 adult, £50 child. More information from 01768-772711, or e-mail team@castleriggmanor.co.uk. Continues this Thursday. There are now 15 candidates for First Holy Communion - please keep them in your prayers. First Holy Communion will be celebrated during the 11.00 am Mass on Sunday 14th June. Volunteers are needed to keep the lawns at Christ the King tidy. The parish has a self-propelled mower which makes it easier. See Fr. Michael. Pope Francis has declared an extra-ordinary Holy Year which will begin on December 8th 2015 - a Jubilee of Mercy. This Holy Year will be be officially proclaimed at St. Peter’s this Sunday. At its heart is a call for us all to enter into a deeper communion with God symbolised through our passing through the Holy Doors. A pilgrimage to Rome is a feature of the Holy Year: if you would be interested in joining a parish pilgrimage to Rome during the Holy Year, then please see Fr. Michael. It would be dependent on at least 30 parishioners expressing a serious interest in a pilgrimage. THERE WILL BE A GATHERING FOR THOSE INTERESTED ON TUESDAY 5th MAY AT 6.00 pm AT CHRIST THE KING. Parishioners are still attempting to ‘book a Christening’ via the telephone. Parents should attend a Sunday celebration of Holy Mass and then meet Fr. Michael in person. It is still the expectation when baptising children there is some hope that they will be brought up as practicing Catholics, i.e. that they will grow up knowing that being at the Sunday celebration of Mass is a normal part of being a Catholic: how can they do that if their parents are not attending? Studies have shown that it is often the witness given by a child’s father that is most influential in this - so pray for dads! Have you ever wondered what God’s plan is for you? Have you ever thought that God may be calling you to serve his people as a priest? If your answer is yes to one or both of these questions, then why not contact the Vocations Team and begin to discover what God’s plan is for you. Contact Fr. Darren Carden – priest@lancastervocations.org Tel: 01772 719604 Mobile 07552795060 or Fr. John Millar – jwmillar1@gmail.com Tel: 01228 521509. [Hopefully] commencing Thursday 7th May, we will begin a series of monthly evenings at 7.30 pm in the Parish Centre. The aim of the evenings is to enable exploration of the Catholic Faith - there will a talk for enquiring minds from gifted speakers! On Thursday 7th May, St. Roseann Reddy of Glasgow’s Sisters of the Gospel of Life will be with us for a talk followed by opportunities for questions. Future speakers include Bishop John Keenan, Fr. Lawrence Lew OP, Dr. Caroline Hull, Canon Luiz Ruscillo, Rev. Dr. Andrew Pinsent and Sr Julian Eikman. A wonderful opportunity to come along in a relaxed setting and explore our wonderful Faith! This weekend we have a pastoral letter from Bishop Michael Campbell, O.S.A. There is also a retiring collection for the Ecclesiastical Education Fund which funds the training of men for the priesthood in the diocese. It costs around £140,000 to train a priest over the seven years of study required. Thank you for your offering last weekend which totalled £758.27. Attendance was 245. Monday to Wednesday 10.00 am - 2.00 pm and Sunday 12.00 noon - 3.00 pm. For more information contact the centre manager Trevor Tiffin on 524295. What would happen if we really gave ourselves to God's presence with deep expectation? How often do we make the space to ENCOUNTER God? You are invited to a weekend with the Cor et Lumen Christi community, St Cuthbert’s The Old Convent, Wigton, CA7 9HU, 8-10 May. 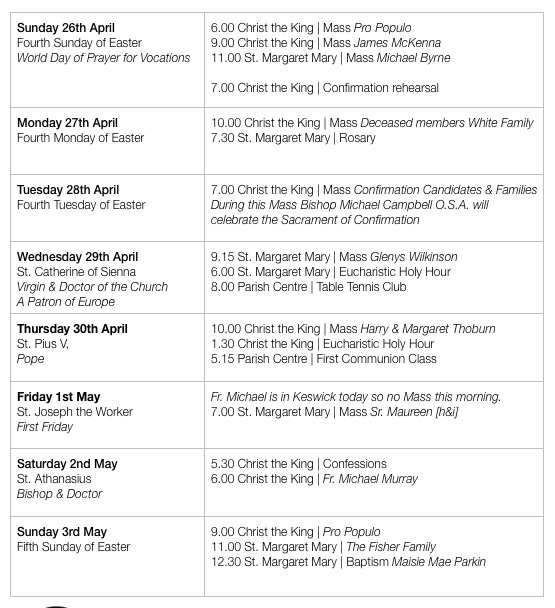 Bishop Michael Campbell will confirm young parishioners at a Mass at Christ the King on Tuesday 28th April at 7.00 pm. Classes resume this Wednesday - we will meet weekly from now until the night of Confirmation. 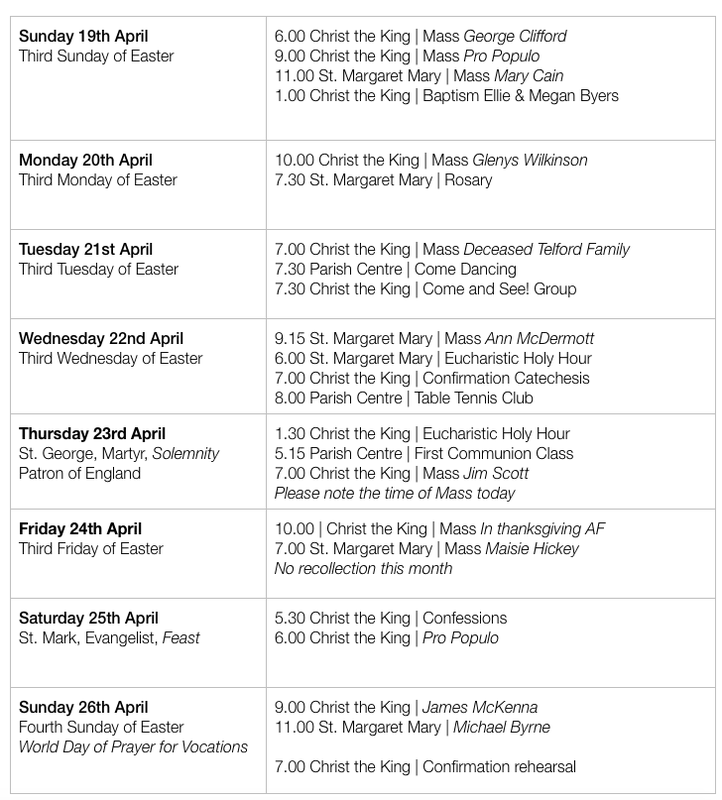 There will be a rehearsal on Sunday 26th April at Christ the King at 7.00 pm - sponsors should also attend this rehearsal if they are able. Continue this Thursday. There are now 15 candidates for First Holy Communion - please keep them in your prayers. I rarely mention finance in the parish but it is worth mentioning it as we enter a new financial year. Please reflect on your weekly contribution to the parish and consider increasing the amount you give. Keeping and maintaining the parish [having a priest; maintaining, heating and lighting two churches; a presbytery; providing for the worthy celebration of Mass and the Sacraments] falls on an individual parishioner’s weekly contribution - the gas bill for the winter quarter alone was just over £6,000. Cardinal Hume was once asked to suggest an amount - he answered by saying ‘the first hour of the week’ - an hour on minimum wage is £6.50. Please give what you can. Tax payers please consider joining the Gift Aid scheme in operation in the parish - this would boost your contribution by an additional 25p for every £1 given at no extra cost to yourself. Many thanks to all Red Mission box collectors at Christ the King - £281.93 was collected. Pope Francis has declared an extra-ordinary Holy Year which will begin on December 8th 2015 - a Jubilee of Mercy. This Holy Year will be be officially proclaimed at St. Peter’s this Sunday. At its heart is a call for us all to enter into a deeper communion with God, symbolised through our passing through the Holy Doors. A pilgrimage to Rome is a feature of the Holy Year: if you would be interested in joining a parish pilgrimage to Rome during the Holy Year then please see Fr. Michael. It would be dependent on at least 30 parishioners expressing a serious interest in a pilgrimage. 10.00 pm. All welcome! For more information please call 016973 45623 or email stcuthberts@coretlumenchristi.org. 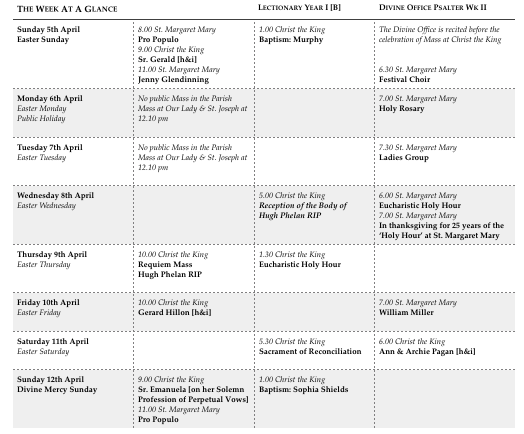 Please note that the Mass on Thursday will be in the evening. Fr. Michael will be in Lancaster from early morning. Thank you for the offering of £652.88 last weekend. 230 were at Mass. Is having a couple of weeks off…a well earned rest. Monday to Wednesday 10.00 am - 2.00 pm and Sunday 12.00 noon -3.00 pm. For more information contact the centre manager, Trevor Tiffin on 524295. Thank you to all who have helped in any way to facilitate the celebration of the Triduum - cleaners, singers, readers, musicians, sacristans, flower arrangers, servers, fire lighters, collectors, those with dirty feet and welcomers. The celebration of the liturgy is never a solo ‘performance’ but rather a work of the whole people of the parish. Thank you. These have now been distributed to needy families - thank you for your generosity and support. Could parishioners at Christ the King please return their red Mission Boxes to the parish so that they may be counted. Envelopes for the next financial year are available for those parishioners who are members of the scheme. Standing order donors do not need to take any further action unless they wish to increase their contribution. If a parishioner, who is a tax payer, would like to join the scheme contact Paul on 511387 for CTK or Richard on 544737. If you have ceased paying tax and are part of the scheme please notify the organisers. The next gathering will be on Thursday 23rd April. Fr. Michael is taking a couple of days off this week on Monday and Tuesday so there is no Mass in the parish until Wednesday evening. 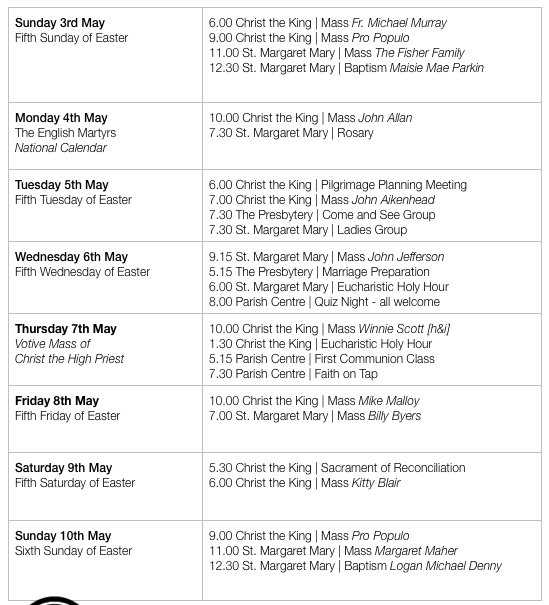 We will mark the 25th Anniversary of the weekly Holy Hour at St. Margaret Mary with a Mass of Thanksgiving at 7.00 pm. Thank you to the great number of parishioners - young and old - who participated in this act of witness. Are guessing the baby this Tuesday evening at 7.30 pm at St. Margaret Mary - all parishioners are welcome to attend this evening. This weekend will include input to help us grow in expectation and hunger for the living God, together with opportunities to really soak in the divine presence by giving our time to God in a variety of ways. Donation only event after £10 registration fee, includes meals! To register, e-mail stcuthberts@coretlumenchristi.org, phone 016973-45623, or visit www.coretlumenchristi.org. Our diocesan residential youth centre, Castlerigg Manor, Keswick, welcomes families to join in their Family Weekend: 22-24 May. Cost: £75 adult, £50 child. More information from 01768-772711 or e-mail team@castleriggmanor.co.uk. Bishop Michael and the organisers would like more parishioners to consider joining the Lourdes pilgrimage this year, 24-31 July, particularly those who are sick or housebound. It is a place of great warmth and comfort that deepens faith and hope. Care is available, including the devoted and competent nursing team. Grants may be available to help with the cost. If you think that you, or someone you know, may be interested, please contact Fr Michael as soon as possible. There was a sense of real sadness on visiting our parish centre this morning. It was not merely the loss of material things but the pain and anguish felt by staff and parishioners who have worked so hard over recent months to build up a resource for the local community. A newly refurbished space was badly damaged by the break-in: a room used particularly by local disabled groups; Slimming World; young children preparing for their First Holy Communion and others. We’ll get on with the task of repairing what was damaged, in the hope of limiting the impact this will have on groups and users of our parish centre. I’d like to appeal to the wider community to help the Police with their enquiries and bring to justice those who sought to damage this resource for the local community. Please keep all involved in your prayers.